Here at Lifewater, we are dedicated to seeing that access to safe water lasts through the generations. That’s why it’s imperative we continue to partner with people like Ayantu, to ensure the sustainability of rural water supply. A young mother in southern Ethiopia, Ayantu is committed to the long-term functionality of her local water point. 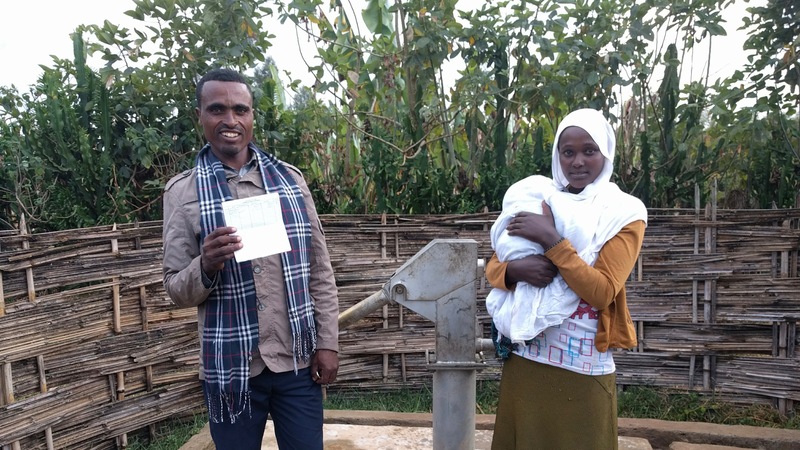 She serves as the cashier for her local water committee, which means she gets to be a driving force in maintaining access to safe water for herself, her child, and her community members. Like Ayantu, we understand the importance of sustainability and we are committed to creating lasting change. Donate now to ensure the sustainability of rural water supply. While many rural communities around the world gained access to a source of safe water over the past few decades, many of those water points failed, wasting billions of dollars and years of effort. The UN estimates that in Sub-Saharan Africa alone, between 30-60% of wells have failed. Water points provided through Lifewater, however, have had a 92% success rate over the last decade. Local water committees have been a key factor in our success. Lifewater recently released a whitepaper looking into the issue of sustainability in the context of rural water supply, specifically looking at the use of local water committees for managing the community’s water supply. The whitepaper also reveals the results of a sustainability study completed on Lifewater’s work in Uganda. Others like Ayantu are joining in the efforts to be responsible, local water committee representatives, and take ownership of the sustainability of their water supply. At Lifewater, we are blessed to witness these efforts, and to come alongside communities working for lasting change.